Him Outdoors remarked the other day that I rely rather too heavily on crumbles when I’m making puddings. He’s right, I do, but I noticed it didn’t stop him eating this one. The reason I make them so often is that a) we tend to have a lot of home-grown fruit either in the garden or in the freezer, b) they’re easy and you can make the various component parts in advance and assemble them at the last minute if you’ve got a crowd coming for lunch and c) because I like them, okay? I particularly like the flavour combination of the raspberries with the rhubarb, though of course you can mix and match using whatever you have handy, or be a purist and just stick to rhubarb alone (no pun intended). The chopped, toasted hazelnuts in the topping work well with these fruits but you could try flaked almonds if that goes better with your personal combo. 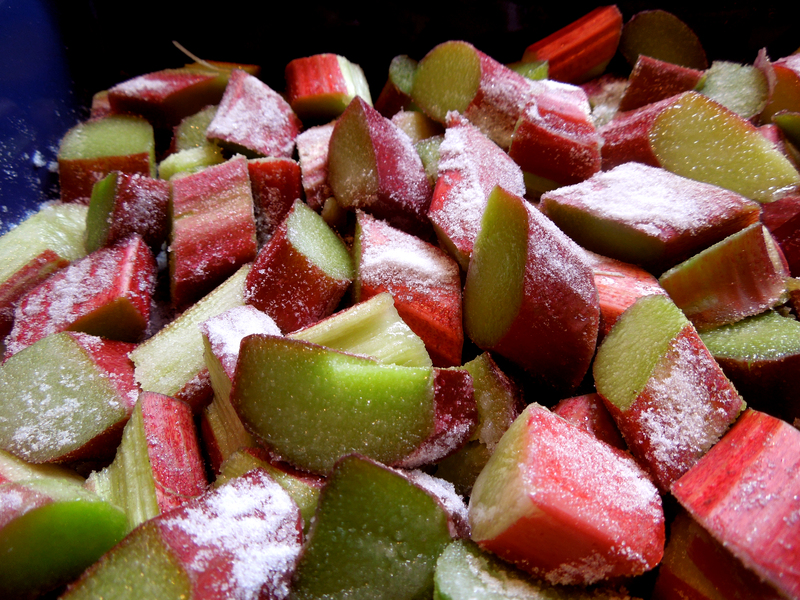 Cut the rhubarb into small chunks, scatter with the sugar and bake in the oven for about 10-15 minutes, until tender when pierced with the tip of a knife but still holding their shape. 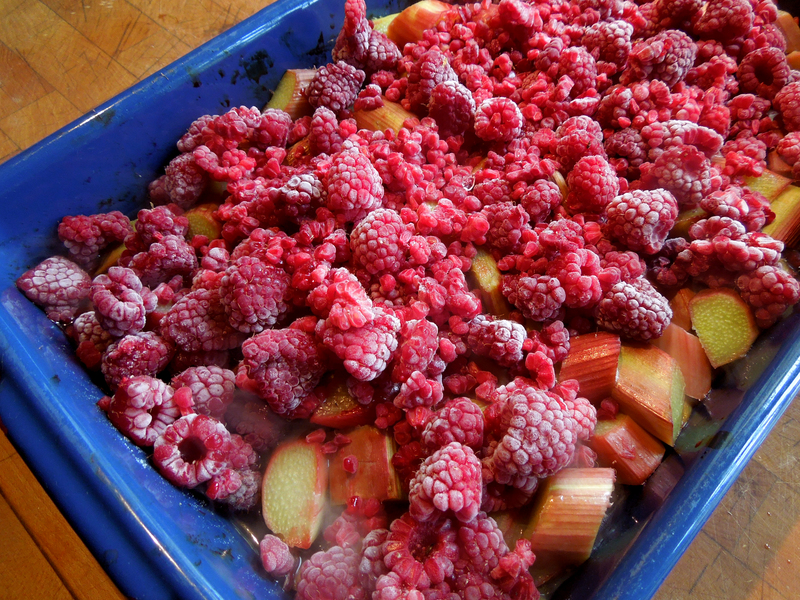 Remove from the oven, strew the raspberries over the top and if they’re frozen leave them to defrost on the hot rhubarb while you make the crumble topping. Check the fruit and if it is swimming in juice, pour some off. Sprinkle the crumble topping over the top and cook for 25-30 minutes or until the topping is golden brown. Allow to cool for five to 10 minutes before serving with cream, crème fraîche or vanilla ice cream. 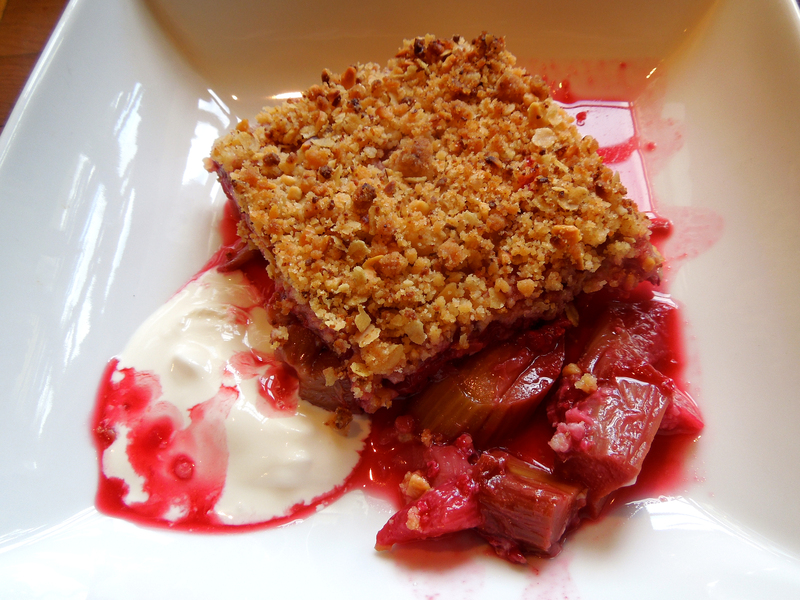 This entry was posted in Desserts, cakes and biscuits, Fruit, In the garden and tagged hazelnut crumble topping, Rhubarb, rhubarb and raspberry crumble by Linda Duffin. Bookmark the permalink. I rely heavily on crumbles too! Living near the ‘Rhubarb Triangle’ up here in Yorkshire I use a lot of rhubarb. I cook the fruit gently on the hob first and my secret ingredient is a tiny slug of homemade sloe gin. Works beautifully (and with plums too). Love the raspberry and rhubarb idea. Sloe gin improves almost anything, IMHO. 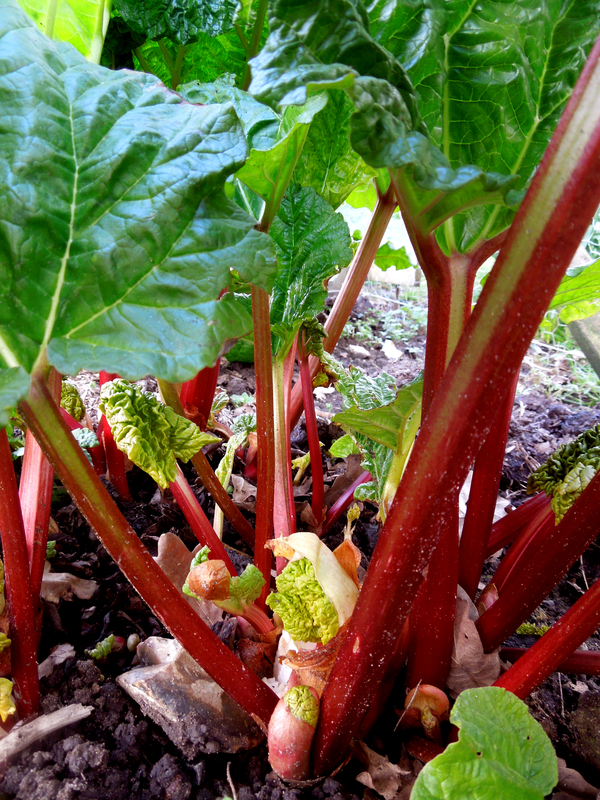 Lucky you, living near the Rhubarb Triangle! Am planning a rhubarb tart after seeing a gorgeous picture of one from Yotam Ottolenghi. No recipe though so will have to improvise. His outdoors doesn’t know what he is talking about. You can’t have too many crumbles. Love the addition of raspberries. Result! Glad you like it, thanks, Tim.